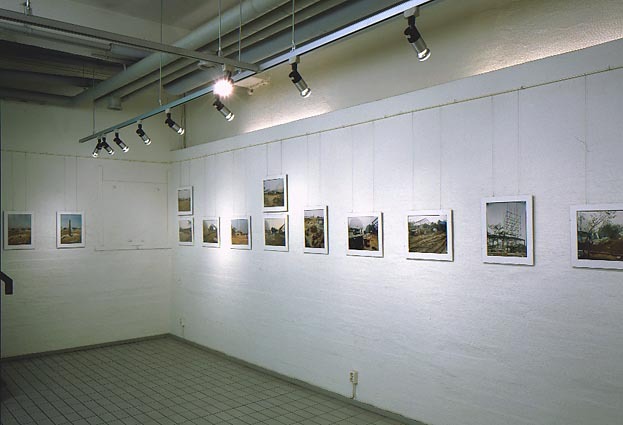 Installation view, Galleria Hippolyte, Helsinki 1994. One of three installation views. The exhibition was held jointly with a show of TEST-paintings at Galerie Anhava, also in Helsinki. On the lower main floor at Hippolyte was installed a series of colour photographs representing the different stages of construction for the Taejon chimney. At the entrance were two large chimney photoobjects leaning against the wall, beside a short presentation text in Finnish and Swedish. Click on the pictures in the photo, for individual views.